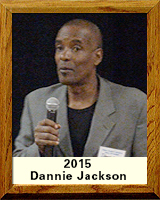 At Santa Rita High School in 1975-76 Dannie Jackson was a 2-time All-American long jumper setting a city record 75’, ranking #1 nationally, and named Tucson Athlete of the year in 1975. In 1976 Jackson was named All-Southwest Athlete of the Year and set the city record in the high jump. In 1975-76, he was state champion in the long jump and high jump and in 1976 placed 1st in the 120 high hurdles. He won the State Decathlon Championship, also setting a school record long jump. The 1977 Penn Relays Long Jump Champ Jackson also helped ASU set a World Record in the 480 yard Shuttle Hurdle Relay. He was WAC lung jump Champ for 1977-78 and still holds the meet record. He was the PAC 10’s Long Jump and Decathlon Champ in 1979 and placed 3rd in the decathlon at the 1981 NCAA Championships, setting the ASU record. A 3-time NCAA All-American, he set a world record in long jump for the indoor pentathlon and collegiate record in the decathlon’ and was 3-time ASU team captain. After college Jackson ranked nationally in long jump and decathlon; qualified for three Olympic Trials; and competed internationally. In 14 years coaching, he helped guide many Chandler High School athletes to event and team championships. In 2009 the Tucson Daily Citizen listed Jackson in the top five high school athletes of all time in Southern Arizona history. Dannie remarked, “if not for injuries I’d have an Olympic medal.” Many of us agree.